New Value Store It Location in Miami - Self Storage Facility in South Florida Now Open! Value Store It proudly announces their new location, Value Store It Miami Airport Center. Conveniently located in the Miami Airport Center Plaza just a few minutes from Miami International Airport, this new location will allow Value Store It to better serve both commercial and residential clients in western Miami Dade with an additional 850 units and over 75,000 square feet of storage space. Value Store It proudly announces their convenient new location, Value Store It Miami Airport Center. Located in Miami, FL the new Value Store It is just east of the Palmetto Expressway, Route 826, located at 7500 NW 25th St. #120. The storage facility is in the Miami Airport Center Plaza just a few minutes from Miami International Airport. This new location will allow Value Store It to better serve both commercial and residential clients in western Miami Dade, including the areas of Doral, City of Miami, Airport West, Fountainbleau, Sweetwater, Blue Lagoon, Medley, and Hialeah. Louis Martin, Manager of the new Miami Airport Center property is “excited to be managing a new Value Store It facility with over 850 units and 75,000 square feet of space. We’re open and ready to let people experience this excitement with us.” Learn more about this facility and new move in specials being offered today! About Value Store It: Value Store It Self Storage is a privately-owned self-storage company based in Fort Lauderdale, Florida. We operate in Florida and Massachusetts offering safe and clean places for residential and business customers to store their belongings. All Value Store It facilities are managed by a professional staff trained to meet your needs and expectations. Their knowledge of the storage industry and the local area make them a reliable source for questions about storage, truck rentals, moving services, and packing supplies. 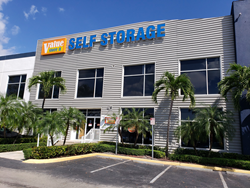 Value Store It Self Storage continues to expand in South Florida and is currently adding properties to accommodate current and future customers.